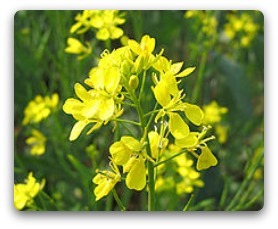 There are several species of wild mustard, these plants belong to the Sibapis and Brassica genus. It is indigenous to North Africa, Asia and Europe. Wild mustard can grow to 30 cm up to 100 cm with much branched or simple stems. Wild mustard has between ten to eighteen seeds for each pod and 2,000 to 3,500 seeds for every plant. White mustard seeds are used in traditional Chinese medicine to treat asthma. In Chinese it is called bai jie zee. Mustard as also been used in Aryurvedic medicine for centuries. German surgeons used mustard paste with water to disinfect their hands. Mustard plaster was used as an old home remedy by African American slaves and many other cultures. Mustard was also used to cure gout, headaches, stomach pain, colds, flu, coughs, numbness, rheumatism, pain relief and chest congestion. Mustard is available in many forms including powdered, dried and fresh, as a paste, oil and liquid extract. Researchers from the Department of Cancer Prevention and Control, Roswell Park Cancer Institute in America have discovered a possible anti cancer compound called allyl isothiocyanate (AITC). The study was conducted on rats that had been fed mustard seed powder. The AITC compound can also been found in wasabi and horse radish. Mustard plasters must not be used on kids under 6 years old. If the mustard plaster is left on the skin for more than 30 minutes it can lead to blisters and burning. Patients with kidney disease, ulcers and venous problems should not use black mustard.